The Ratha Yatra or Chariot festival marks the annual journey of Lord Krishna and his siblings to their aunt's residence more than 5, 000 years back. 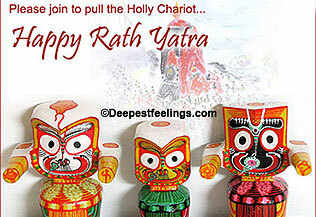 One of the holiest occasions for the Hindu community, Ratha Yatra is celebrated in India as well in many places abroad during the months of June/July (Rainy Season). Join into the Ratha Yatra festivities and bond with your friends and loved ones by sending these fantastic e-cards that have specially been made for the occasion. 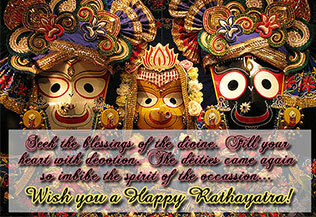 All these e-cards are free and are appropriate to greet your loved ones with during Ratha Yatra. 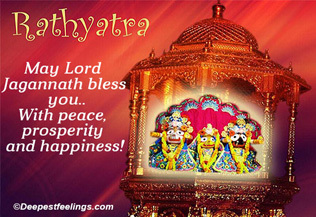 If you like our collection of Ratha Yatra e-cards, please click here and pass on this page to your friends and dear ones. 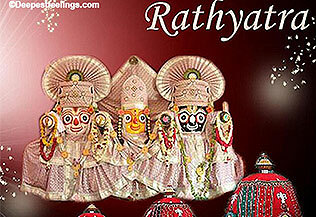 Wish you a Happy Ratha Yatra! Imbibe the spirit of the occasion..